My nine-year-old daughter Dani loves dragons (and snakes, lizards, alligators, tarantulas, scorpions, sharks, etc. ), and her favorite dragon is Smaug from The Hobbit (she claims he was just misunderstood). We read the book as a family a couple of years ago and she just loved it. 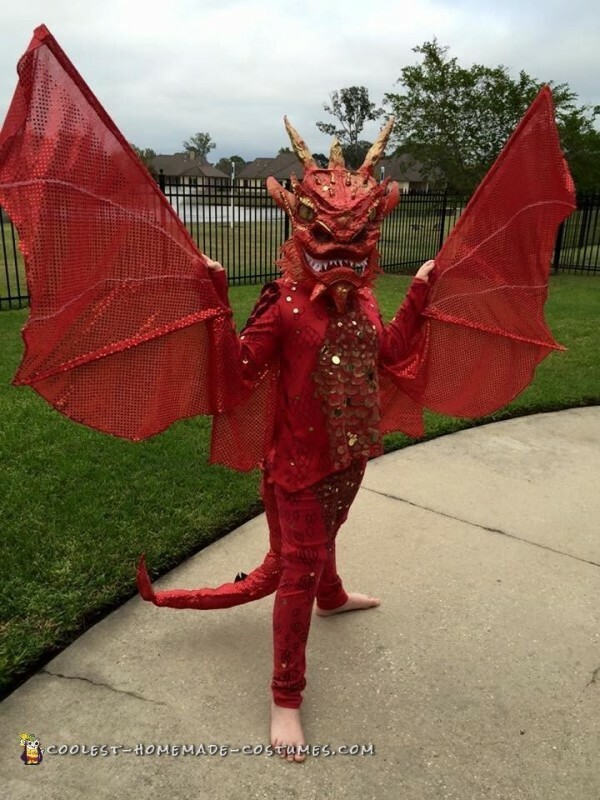 She decided a while ago she was going to be Smaug for Halloween. 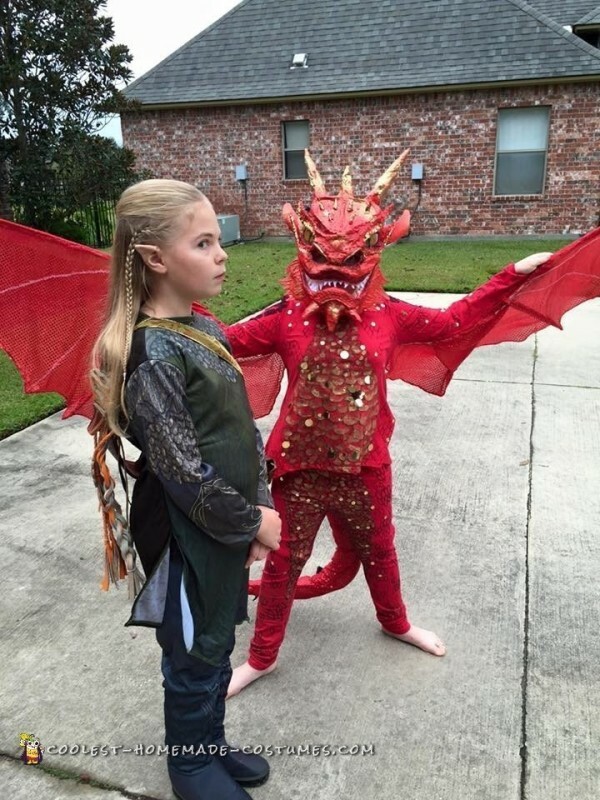 I looked, and there aren’t any Smaug costumes available for purchase, so we were off to the drawing board. She is very artistic, so I put her to work as well. For the body we bought plain red leggings and a shirt. My daughter drew on all of the scales with a Sharpie (I helped with the front of the shirt) and we painted on the gold and added sequins. The wings are a light shiny fabric attached to the sleeves, with wooden dowels placed inside so she could grab them and make them flare. I used a lot of hot glue (didn’t feel like getting the sewing machine out). The mask is made from a milk carton. We added cotton for depth, aluminum foil horns, and covered it all with masking tape. I added scale details using hot glue as a medium. Then we had fun painting it. My daughter did the eyes, behind which we put tea-lights when it’s dark so they glow. It’s cool. It doesn’t look it, but the mask is actually really light-weight. The tail is made of the same fabric as the wings. It was stuffed with cotton and a wire hanger (to shape it) and hand-sewn on to the back of the shirt. Reactions were those of amazement. No one could believe we made it from scratch. I was told I’d missed my calling in life, and should do this professionally, lol. No thanks. I must admit that I liked the challenge, though. I’ve made other costumes for my daughters in the past, ranging from Tinkerbell to Tron to Nightmare Moon (we’ve even made a Creeper). I think Smaug has been the most challenging. 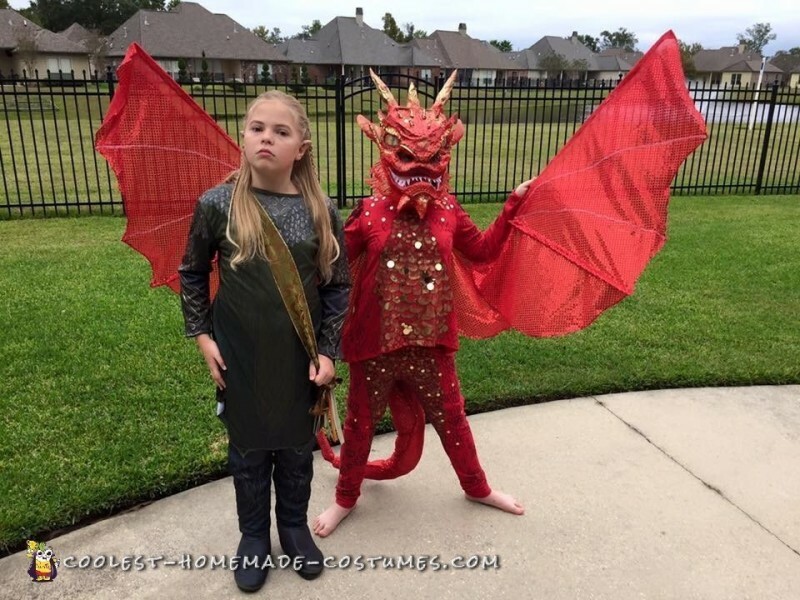 My favorite reactions are of how cool my daughters were for their costume choices (my other daughter Riley, age 10, decided to go as Legolas to compliment her sister). That, I can’t take credit for. Everyone was taking their picture, oohing and aahing, loving it.